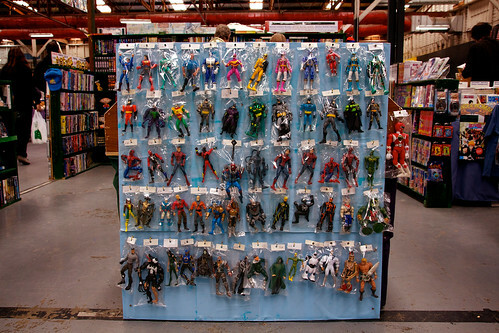 Wall of Superheroes a photo by BaboMike on Flickr. Not one of the better days of our Hobart life so far. Pudding the cat, while not out cat, was hit by a car a few days ago and we only just found out. He was such a nice friendly kitty. The perfect cat almost. Well, obviously he was too adventurous for his own good. Having got himself stuck in peoples sheds numerous times. He even managed to get himself stuck in our house one day. No idea how he got in. His visits every morning will be (and already are) sorely missed. RIP Pudding. On to other things. Late pictures. Well, the photo’s themselves are not exactly late. They have been available on Flickr and Twitter for a few days. But, me being an idiot, changed my blog password on Thursday while at work, and forgot to notice that due to some IT changes in the DoE, my passwords didn’t automagically sync to “the cloud”. Being a long weekend I couldn’t just go and get them. So, had to create a new one, again. Oops. Sorry. Bad me. Whatever. The photo of today is from the local markets that are held at the Hobart Showgrounds every Sunday. Unlike the other (good) Sunday marked full of yummy things and bacon and cakes etc, this one is like the contents of a thousand grandmothers houses all for sale. All sorts of lace, ceramic cats, knitted oddities etc. I did like the wall of superheroes as you can see here. I’m putting money on it that they are chinese specials, and not the real deal. Stlil, fun to look at. Would I recommend those markets? Not really unless you have a ceramic cat fetish, or like commemorative plate from the Montreal Olympics etc.